FmPro Migrator Platinum Edition 8.35 - Adds New PHP Reserved Words, MySQL Column Name Reserved Words, Commenting of FileMaker Calculations Having Missing Table or Missing Field Errors. Scale-up existing database solutions to PHP web applications supporting 11 SQL database servers. 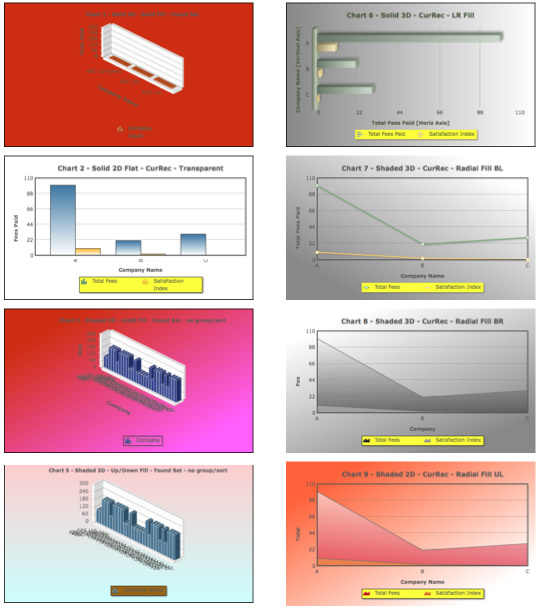 Export charts to pChart-generated PNG image files in batch mode for high traffic web sites. Convert FileMaker Pro 11+ Charts into server-side pChart charts or client-based Fusion Charts. Convert Portals into jqGrid objects or ExtJS 4 Grid objects having record editing, insert and delete features. Tab Controls and their enclosed objects are converted recursively any number of levels deep. Static and Dynamic Value Lists are converted into PHP code. Table Occurrences and Relationships are converted into MVC architecture Model files (including field validation). FileMaker Pro scripts and Calculation fields are converted into executable PHP code. Quickly build secure PHP web applications supporting any web browser or mobile device, for cloud hosting your app. Save money by building a functional web application from your original database which can be further enhanced by PHP developers anywhere in the world. 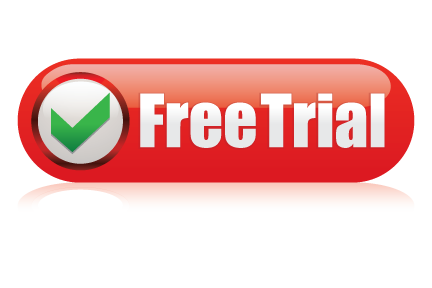 The PHP Conversion License key is included with FmPro Migrator - Unlimited Number of Database Files - Platinum Edition (1 Year Duration). PHP Conversion projects can also be performed as either Turn-Key or Fixed-Price Consulting projects. The video linked below covers this topic, and more details are available via phone or email on the Contact page. Client-based, interactive, 3D chart creation. High performance PHP-based data grid object. A Growl-like dialog box for web apps. Fast, lightweight tab panel implementation. Quickly Prototype Web Applications with FileMaker Pro Advanced - FileMaker Pro is recognized as the leading easy-to-use database development software. FileMaker Pro Advanced can be used with FmPro Migrator Platinum Edition as a rapid application development environment to quickly prototype scalable PHP web applications for 12 SQL database servers (including FileMaker Server Advanced). The PHP web application generated by FmPro Migrator uses an ODBC connection to FileMaker Server Advanced, providing significant performance enhancement over the FileMaker PHP API. Save Time, Get Up and Running Quickly - Web application development is typically a very time consuming and expensive development process. Offshore IT consulting firms often charge between $1K - $5K USD per FileMaker layout for manual PHP web application development projects. Furthermore, the consulting firm needs to fully understand the inner workings of a FileMaker Pro database application. FmPro Migrator Platinum Edition can performs an automated conversion of even large complex applications in a matter of minutes. The resulting PHP web application incorporates the look of the original desktop database as a functional and scalable web application. The ability to efficiently perform FileMaker Pro to PHP conversions makes it possible to quickly show web application prototypes to prospective customers. An automated migration process represents the ultimate in rapid application development, which can't be matched by any other development environment. Being able to show customers a rapid prototype may make the difference in getting approval for a new client project. If you are not an experienced PHP developer, you can still benefit from using FmPro Migrator Platinum Edition to generate a PHP web application from your FileMaker Pro database file(s). As a result to doing the automated conversion, you will have a functional web application you can use for testing and further development. You can then send your generated PHP web application to a PHP developer anywhere in the world who can make further enhancements. The automated conversion process greatly reduces the overall development cost, because the PHP developer can immediately start working with a functioning web application - reducing costly typos and other errors. Script Conversion - Each FileMaker Pro script captured by FmPro Migrator, is converted into executable PHP code within the top-level converted_scripts directory. These scripts are intended to be used as a template for the writing of new PHP code which will be used to replace the original FileMaker Pro script functionality by the PHP developer. FileMaker Pro script instructions are parsed and replaced with one or more equivalent PHP commands. The script conversion process can be customized by editing the table of conversion records within the FmigScriptConversion.db3 SQLite mapping file. Sophisticated Web Application Features Implemented Automatically - The generated PHP web application includes professional looking features to your PHP web application automatically. Some of these features like the Grid or chart objects might require dozens of hours of work to add to your project manually. The implementation of the Gritter feature provides professional looking Info or Error dialogs which can have a timed fadeout feature, similar to MacOS X Growl dialogs. Vector graphic objects implemented via the RaphaelJS library provide high quality vector graphic object drawing of objects which look good at any screen resolution, to match the look of the original FileMaker Pro layout objects. Each FileMaker Table Occurrence is converted into a model file used by the PHP framework. Non-record filtering relationships are incorporated into each model along with field validation and Auto-Enter field calculation code. Since models in the MVC framework are based upon TOs instead of base tables, field and portal bindings work correctly within the generated PHP web application. Each FileMaker Pro layout is converted into 6 view files, with a corresponding controller providing actions for each form. 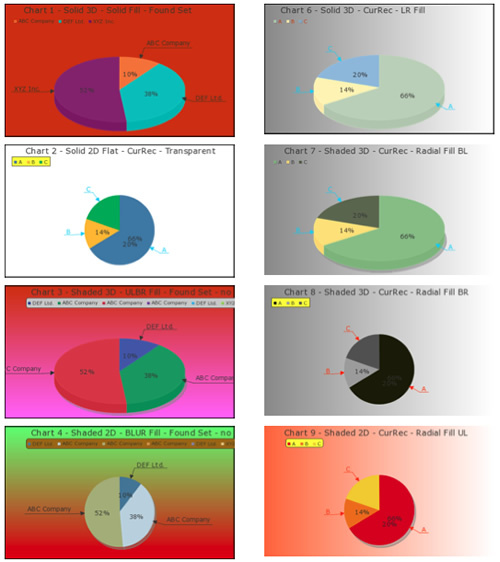 FileMaker 11 charts can be converted into pChart server-side PHP charts. By default, the generated charts are rendered and displayed in real-time within the web browser web page. Alternately, the pChart charts can be rendered to a PNG image on the web server for use on high traffic web sites. Either way, the generated charts will look identical when displayed on any web browser or mobile device. 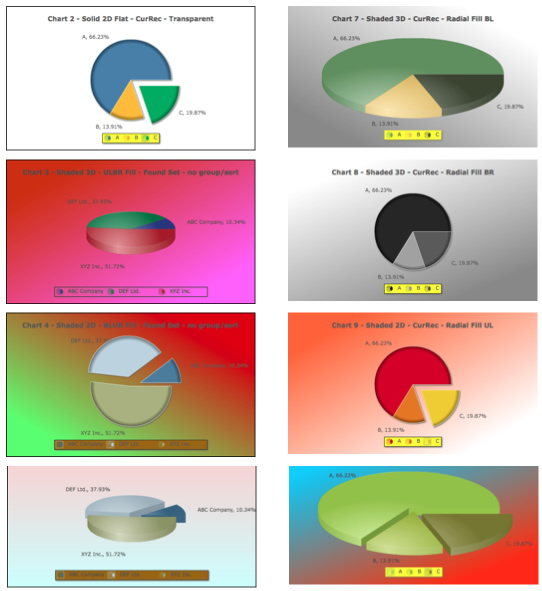 The generated charts will utilize the original FileMaker color scheme, retrieved from the layout object. Each FileMaker color scheme has been designed as a pChart color palette file, stored within the pChart directory created by FmPro Migrator. 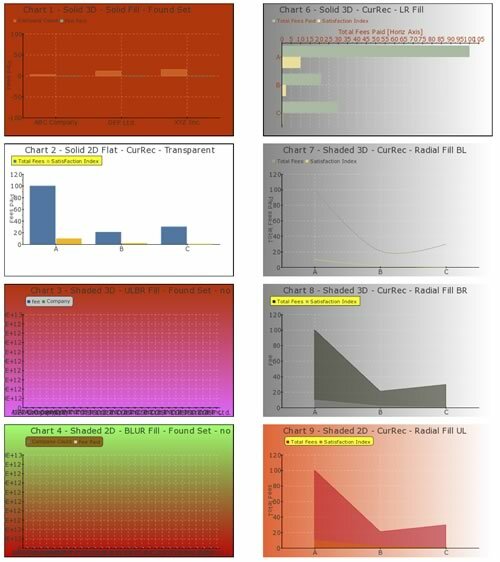 Each chart uses the fields specified on the original layout, as well as using the original summary and grouping specified in the chart setup dialogs. Data can be retrieved from the current record, using either CSV or return separated data, with no code modifications. Data can also be retrieved from any specified group of records, with a modification to the find() query in the generated PHP code (by default, all records are returned). Additional changes can be made to the generated PHP code to implement additional types of charts which are not natively implemented in FileMaker 11. The pChart software is included and embedded within FmPro Migrator Platinum Edition via an OEM license, at no additional cost. Either version of the Fusion Charts generated charts will utilize the original FileMaker color scheme, retrieved from the layout object. Each FileMaker color scheme is output as a series of HEX values written to the configuration XML sent to the chart object. The Fusion Charts charts also use the fields specified on the original layout, as well as using the original summary and grouping specified in the chart setup dialogs. Data can be retrieved from the current record, using either CSV or return separated data, with no code modifications. Data can also be retrieved from any specified group of records, with a modification to the find() query in the generated PHP code (by default, all records are returned). Additional changes can be made to the generated PHP code to implement additional types of charts which are not natively implemented in FileMaker 11. Grids displayed on edit forms provide record editing capabilities, including record insert, update and delete features. Grids displayed on view and edit forms provide sorting and hiding of columns. 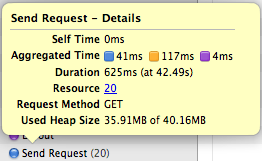 The range of values measured during PHP performance testing was from 625ms - 1.7sec. The best measured value of 625ms was measured across the internet to the PHP web application and MySQL database hosted at the DreamHost data center. For the PHP test results, the value listed does not include approximately 300ms of time required to create a jqGrid object from each portal. The jqGrids are created individually in parallel with the page loading, so that the user does not have to wait before seeing the display of the rest of the page in the web browser. The range of values measured during IWP performance testing was from 294ms - 3.94sec, using FileMaker Pro Advanced 11 running locally on a MacBook Pro computer. 2) IWP is limited to 100 simultaneous web connections. 3) The PHP application includes support for web incompatible script steps such as the Beep and Print scrip steps. These two Safari web browser screenshots show performance results comparing the PHP code generated by FmPro Migrator Platinum Edition and the same layout displayed within IWP. The color legend is: blue=load time, orange=script execution time, purple=render time. These tests do not compare Custom Web Publishing performance, which is expected to be significantly slower due to performance limitations of the FileMaker PHP API. 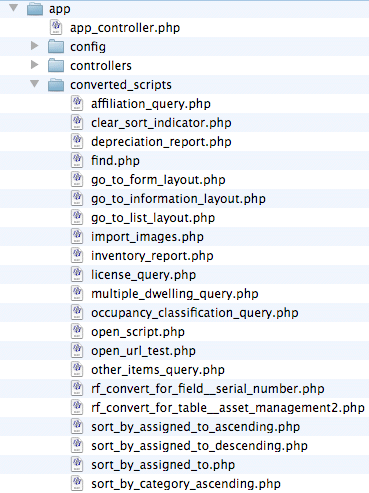 Static and Dynamic value lists are converted into PHP code within the app_controller.php file. Individual value list functions are only executed if they are used on a particular form, in order to improve performance. Dynamic value lists will display either 1 or 2 fields on the web form, just as they were configured in the Edit Value List dialog. The contents of either type of value list will also be used for creating checkbox and radio button groups. Radio buttons and checkboxes are implemented to use either static or dynamic value lists as they were configured on the original layout. Radio Buttons and Checkboxes which are taller than 20 pixels, will be created as vertically oriented objects with an HTML "<br/>" tag separating each value. This feature can be easily changed within the controller code for the view. 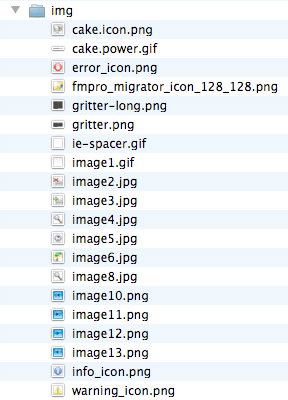 Embedded layout graphic images are saved into the img folder within the application webroot directory. Only unique copies of images are stored within the img folder, in order to prevent wasting space due to duplicate images. This means that if an image such as a company logo is used on 100 different layouts, only one single copy of that graphic will be saved, as all of the other 99 copies are duplicates of the original image. Tab Controls are converted into Adobe Spry TabbedPanels, including all embedded objects. Embedded Tab Controls are processed recursively any number of levels deep. The selected tab of the Tab Control is automatically saved to SESSION memory for each user, so that the selected tab is automatically restored when navigating between records or switching between forms. The navigation toolbar provides record navigation, form navigation and mode switching for the generated PHP web application. Switching between operating modes, displays a toolbar displaying the appropriate icons as disabled. Disabled icons will also be put onto the toolbar if the entire web application has been generated for Read-Only data access. When switching between operating modes, the user is kept on the same record within the database, thru the use of SESSION variables. Authorized users many quickly duplicate any record by clicking the Duplicate button, which duplicates the record and opens the record using the edit form to allow further changes. The form navigation menu enables easy navigation between forms within the web application. 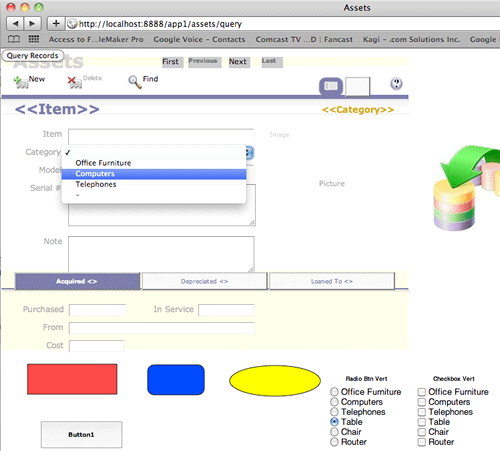 By default, this menu contains all of the forms which have been created for the web application. This list can be statically or dynamically modified by changing the contents of the define_nav_toolbar_forms_list_value_list function within the application_controller.php file. When switching between forms using the same CakePHP model, the user is also kept on the same record within the database, thru the use of SESSION variables. 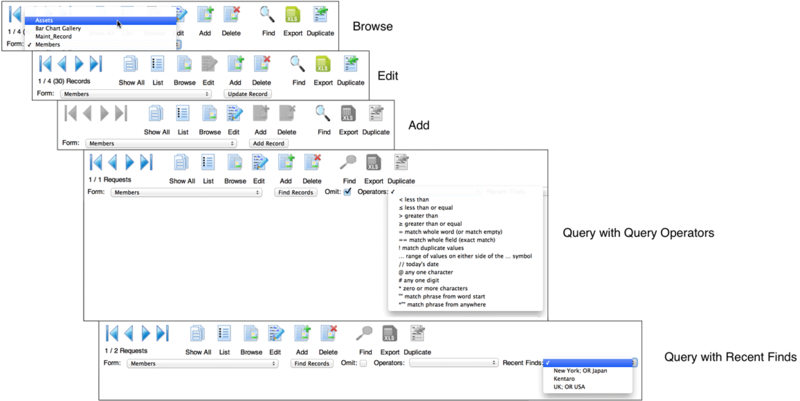 The Query toolbar includes support for the Omit option and 14 of the FM query operators. Once a query has been performed the user sees a list of paginated records and can click the appropriate View/Edit/Query/Delete buttons for each row. Clicking the View or Edit buttons opens the record using the converted form. When running in foundset mode, the records display shown above shows 1 / 4 (30) to indicate the record position within the foundset followed by the total records in the table displayed within parenthesis. The Export to CSV feature exports the current foundset of records for any converted layout into a downloaded CSV file having column titles. Web browsers on desktop and mobile devices usually pass this CSV file directly to an installed spreadsheet application. By default, every field on the form will be included in the CSV file, but the column titles and list of exported fields is easily customizable within the export_csv() function of the form controller. The jquery.gritter.js plug-in provides a professional looking non-modal alert dialog box for web applications. The dialog looks similar to a MacOS X Growl alert dialog - however it is cross-platform and cross-browser compatible. This plug-in is fully integrated into the generated web application wherever flash messages are sent from within controller code. By default, Info dialogs stay on the screen for a few seconds and then fade out. Error dialogs (i.e. validation errors) stay on the screen until closed by the user. The behavior and look of the dialogs is fully customizable by changing the image files in the webroot directory or the flash_info.ctp or flash_error.ctp files within the views/elements directory. 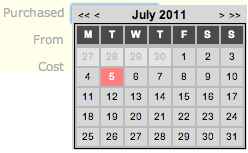 The jquery.datePicker.js plug-in is enabled for each field on the form which was configured with a calendar picker on the original FileMaker layout. The styling of the datePicker can be configured site-wide thru making changes to its .css file within the webroot/css/jquery directory. Each converted layout includes query and querylist view files to provide query by example processing. Fields, menus, radio button groups and checkboxes can be used when submitting the query request. Radio button groups and checkboxes are searchable in exactly the same manner as within the original FileMaker database. Data transferred from FileMaker database files will be searchable because the same return character item separator is used within the PHP controller query code for processing radio buttons and checkboxes. The primary keys for the records found by the query are stored within the foundset session variable. Only the foundset records will be displayed within the QueryList view. Clicking on the Show All Records button on the QueryList view clears the foundset session variable and displays all records using the index view. As long as the foundset session variable is not empty, the user will get redirected to the querylist view instead of the index view, in order to allow the user to work with the current foundset of records. Stored Calculation fields get calculated before a record is saved into the database within the beforeSave() model function within the model files. Unstored Calculation fields are calculated before the value is used within the view controller file, within the view and edit actions. Simple arithmetic or concatenation calculations are converted automatically into PHP code. This unstored calculation code shows the conversion of a SuperContainer URL which concatenates a global field, the primary key column field and static text defining the SuperContainer options. 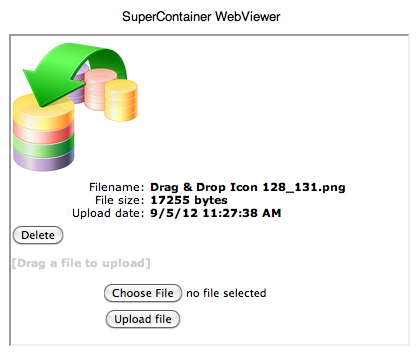 FileMaker WebViewer objects are converted into iFrames on the converted forms. Standard WebViewers having calculated URLs are supported as well as WebViewers used with 360Works SuperContainer servers. The WebViewer URL may have its calculation provided directly within the WebViewer setup dialog or thru the use of global or calculation fields. In addition to object scripting features, two report files are generated to provide script and object dependency reporting for each layout and script within the converted solution. • Enter Find Mode - Redirects the user to the Query form for the same layout. • Enter Browse Mode - Redirects the user to the View form for the same layout, using the record stored within the $_SESSION['current_record'] variable for the current model. • New Record - Redirects the user to the Add form for the same layout. • Delete Record - Prompts for confirmation, then deletes the current record if the user clicks Ok.
• Show All Records - Clears the $_SESSION['foundset'] array for the current model. 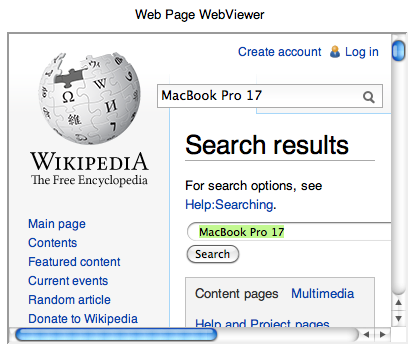 • Open URL - Opens the specified web page URL in a new browser window. • Goto Layout - Opens the View form for the specified converted layout, and opens the most recently visited record. If a form using this model has not previously been visited, the first record in the model will be displayed. • Perform Script - Executes the specified converted script as a function call within the current controller file or AppController. • Print - [FM Web Incompatible] - Opens the web browser print dialog to print the currently displayed form. Record navigation script steps include: Goto Record/Request [First], Goto Record/Request [Last], Goto Record/Request [Previous], Goto Record/Request [Next]. • Show Custom Dialog - [FM Web Incompatible] - Displays a simplified Show Custom Dialog window using jQuery Gritter, having 1 button, a title text and message text. If more than one dialog is displayed at once, they stack up vertically until dismissed (similar to IOS or MacOS X notifications - except within your web browser). Each FileMaker Pro script and Custom Function is converted into a separate PHP code file within the application directory. These scripts are intended to be used as a starting point for further development by an experienced PHP developer. FileMaker Goto Layout script steps are used by FmPro Migrator to determine the correct PHP application model to use for instructions which follow. This is the same concept employed within the FileMaker Pro database in order to position the script step at the correct location on the Relationship Graph. Enabling the Basic Authentication feature within the PHP Conversion preferences dialog triggers FmPro Migrator to generate login and role based security management code within the PHP web application. [Full Access] - This is the role which is required for administration of the User accounts. It is also the role required in order to view/edit records in the Base Table Controllers list shown on the default.ctp home page. The first user account created is automatically granted the [Full Access] role so that it can be used to administer the other user accounts. No role is automatically assigned to any other account used by the web application. Roles for additional accounts must be manually assigned by an administrator to the additional accounts. [Edit Only] - Edit, View, Query, QueryList actions allowed, no access to Delete, Add actions. No administrative access. [Read-Only Access] - View, Index, Query, QueryList actions allowed, no access to Edit, Delete, Add actions. No administrative access. [Data Entry Only] - Index, View, Index, Edit, Delete, Add, Query, QueryList actions allowed. No administrative access. Additional refinement of the roles can be added to any layout controller to restrict access. 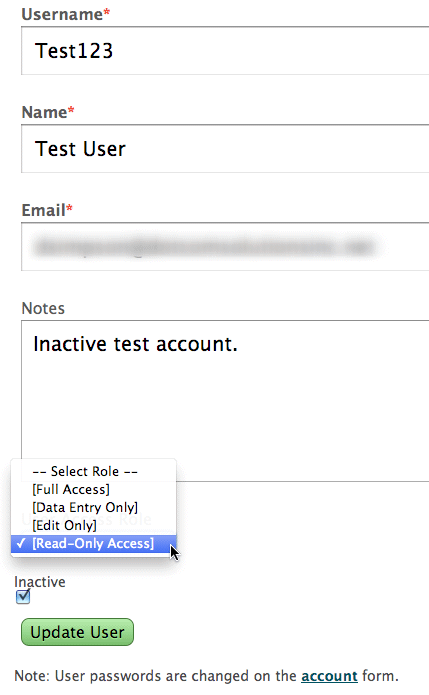 Administrative users with the [Full Access] role can directly edit user account information, except for the password. User accounts can also be set to the Inactive status to prevent logins. Users may initiate the recover password process by entering their email address if they have lost their password. A temporary login token, followed by a temporary password will be sent to the user. Administrators cannot directly see or change clear text passwords, because only the encrypted passwords are stored in the database. 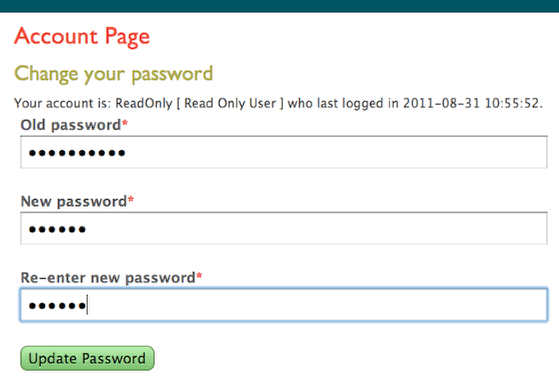 Users may also change their password at any time by using the Account Page. The Data access preference item provides control over the Add, Edit or Delete records features within the generated web application. This feature removes unnecessary controller and button code, preventing data modification if it is not required in in a publicly available web application. This feature makes it easy to generate a full featured admin application plus also generate a 2nd Read Only version of the web application for public access to the data. FileMaker static tooltips are converted into CSS tooltips, for each object on the layout. By default, each tooltip is designed to look like the original tooltip in regards to padding, border, drop shadow and background color. All of these attributes can be easily modified site-wide by updating the Fmig.css file within the webroot/css folder. 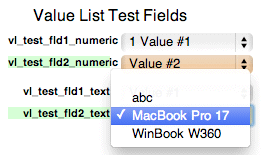 FileMaker merge fields may contain database fields or text with database fields within the same text label object. This same functionality is also implemented within the text labels implemented within the web application view files. The field contents are dynamically updated within the text label based upon the contents the database field. // - Current date, in mm/dd/yyyy format, displayed based upon the locale of the server where the PHP code is executed. :: - Current time, in 24hr HH:MM:SS format, displayed based upon the locale of the server where the PHP code is executed. || - Current logged in username. @@ - Current record number. This symbol is displayed as the record position number of the current record within the current foundset. ## - Current page number. This symbol is generally only applicable to printing, and within FileMaker will be displayed as a "?" placeholder if not in print preview mode. 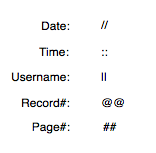 This symbol is replaced with the CakePHP Paginator page# of the current page of records being displayed. Due to the complexity associated with any PHP development project, it is recommended that a small test project be completed prior to starting the full conversion project. 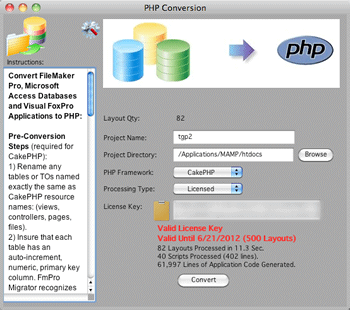 By default, FmPro Migrator Platinum Edition processes PHP Conversion projects in demo mode without a license key. In Demo mode, FmPro Migrator Platinum Edition will process 5 layouts and 5 scripts. Using the demo mode at no charge, enables FileMaker developers to become familiar with the conversion process and see the completed layouts running as a functional web application. FmPro Migrator Platinum Edition - FmPro Migrator Platinum Edition is used for capturing the structure info from the FileMaker Pro database file and generating the PHP web application files. FmPro Migrator Platinum Edition utilizes the DDR XML file generated by FileMaker Pro Advanced, along with AppleScript(MacOSX) or a compiled WinAutomation (Windows) job file [provided at no cost] in order to automate the capturing of Tables/Fields, Layouts, Relationships and Scripts. Once the info has been captured by FmPro Migrator Platinum Edition, click the PHP Conversion button on the GUI tab. Complete instructions for the PHP Conversion feature are included a detailed PDF file. In demo mode, FmPro Migrator Platinum Edition will convert 5 layouts and 5 scripts into a PHP web application. Buying an FmPro Migrator Platinum Edition license key provides full-featured migration of the quantity of layouts ordered. This license key enables the processing of the specified quantity of layouts for an unlimited number of FileMaker Pro database files for the duration of the license key. FmPro Migrator Platinum Edition may also be used by the PHP developer to perform the conversion of the FileMaker Pro database tables and data into one of the supported SQL database servers. FileMaker Pro Advanced 11+ - FileMaker Pro Advanced is used for creating a DDR XML export file providing the structure of the FileMaker Pro database file. This file is used for importing the relationships and layout display order info associated with the layouts. Note: FileMaker Pro Advanced 11 databases containing Unicode characters may cause problems during processing, as these characters are not properly encoded on the clipboard or within the DDR XML file. AppleScript(MacOS X)/WinAutomation(Windows) - FmPro Migrator Platinum Edition utilizes one of these two utilities to drive the FileMaker Pro user interface to automate the capturing of layouts from via the clipboard from FileMaker Pro.